I know this is getting rather old: I post a pic or a link of a bag I have fallen in love with. I might then go on about it for a while. And then I find reasons for not buying it. Usually like it can't be carried properly, might show wear to easily or is too small. But every now and then I come scarily close to purchasing - or actually follow through. I recently came across the Danish bag designer Rodtnes and was instantly hooked by their timeless styles and lush looking leathers. 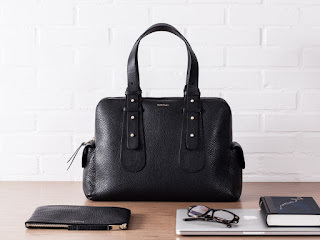 The Loretta bag seemed to tick all the boxes: good size, compartments - even a space for my laptop, handles that can be lengthened to go on your shoulder... the list went on. The only drawback: it only came in black and I found that a bit too severe. Imagine my delight when they announced the launch of a grey version - with 20% off until 23rd of April! So one of these will be winging its way to me!